Some 98 per cent of the engineering works of the CGP III is complete. JGC Corporation, one of the leading engineering, procurement and construction (EPC) contractors in the Middle East with an order book worth billions of dollars, is on track to commission a $355-million gas plant in Bahrain by the second quarter of next year. 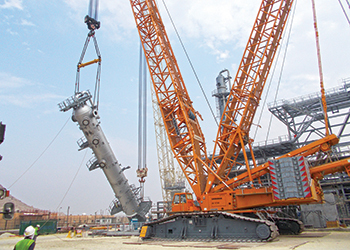 The Central Gas Plant Three (CGP-III) is being built as part of an expansion at Bahrain National Gas Expansion Company (BNGEC) to treat 350 million standard cu ft per day (mmscfd) of unprocessed associated gas (AG). The plant, which will be equipped to process wet gas, will produce LPG (liquefied petroleum gas) and naphtha. BNGEC is operated and managed by Bahrain National Gas Company (Banagas). A second part of the project involves installation of new field pipelines and expansion of BNGEC’s Sitra storage facility. JGC Gulf International, a subsidiary of the Japanese major, is responsible for carrying out the $99-million pipelines and storage expansion, which is scheduled for completion in Q4 next year. At present 98 per cent of the engineering works of the CGP III is complete, while procurement will be finished by the end of next month (October). The main civil works are ongoing with 80 per cent of it complete, Kenji Ito, project manager at JGC Corporation, tells Gulf Construction in an exclusive interview. An amine absorber being installed at the acid gas removal unit. Construction will reach its peak during September, October and November 2017, and pre-commissioning will start from Q1 next year onwards. The scope of works at CGP III includes setting up an acid gas removal unit, dehydration unit, natural gas liquids (NGL) recovery unit, C3 and C4 treating unit, utility (water, air, nitrogen, hot oil) and offsites. The units will extract LPG products for exports from associated gas, Ito says. For the plant, the residue gas compressor was fabricated by Siemens, Germany, the turbo expander by Cryostar, France, and the major static equipment by Wooyang HC, Korea. Wooyang also fabricated the amine absorber/regenerator, de-ethaniser, LPG splitter and de-propaniser. For the Sitra tank and pipeline project, the storage tanks are being made by Felguera IHI, Spain; propane compressors by Mitsui Engineering & Shipbuilding Company, Japan; propane and butane pump by Weir Gabbioneta, Italy; instrument air (IA) compressors and dryer units by Gardner Denver, South Korea; 38-m-high warm flare by John Zink Hamworthy Combustion, Italy; fire water pumps by SPP, UK; and fire protection system by Solas Marine Services, Bahrain. The major civil works of the two projects were undertaken by Mechanical Contracting & Services Company (MCSC) of Bahrain, he says. Ito says time was a major challenge in executing CGP III, as it had to be built within a tight schedule. “One of the measures to cut the schedule and get the project running in 29 months was to apply construction-oriented design right from the beginning. JGC also employed 3-D modelling and created a construction database where the actual progress is seen on 3-D. In addition to its technical expertise, JGC is also able to deliver value in terms of costs, Ito points out. “Our design enables not only reduced capex (capital expenditure) but also aims for the lowest opex (operational expenditure). We believe Banagas valued our ability to meet client needs along with the lower capex, and also our experience in completing the first and second trains,” he says. The CGP-III ... scheduled for completion in Q2 next year. Elaborating on the field pipelines and Sitra storage expansion project, JGC Gulf says about 85 per cent of the engineering works, 50 per cent of the procurement and 10 per cent of the construction work are complete. The scope of the work includes providing EPC services for the storage facilities (comprising LPG storage tanks and chiller unit) and pipelines. The expansion provides an additional 100,000-barrel-capacity tank for butane and a 200,000-barrel-capacity tank for propane, and a new Train-Three LPG refrigeration unit. For the pipelines, JGC Gulf is designing and building a new AG/refinery off-gas (ROG) gathering and pipeline system from nine existing TP (transportation process) compressor stations to CGP-III. The residue gas stream produced from CGP-III will be piped to the existing headers for re-injection. It will then connect the naphtha product outlet from CGP-III to the existing pipeline to the Bahrain Petroleum Company (Bapco). The work also involves designing and building a new 21-km butane pipeline to the Sitra storage and export facility. As this is a brownfield project, safety and co-ordination were among its top challenges. 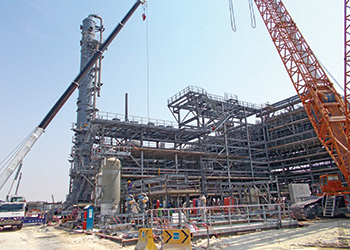 As most of the pipeline construction is being executed outside the plant site, close co-ordination is required with the client and other parties such as Bapco, Tatweer Petroleum, existing Banagas facilities and the government authorities concerned, according to JGC Gulf. For the project, MCSC executed the general civil, mechanical, electrical and instrumentation works, while Felguera of Spain and Bahrain’s Ramsis fabricated the storage tanks. Bahrain-based Al Hassanain undertook the land reclamation and Al Ahlia Contracting Company, also of Bahrain, built the Electricity Distribution Directorate (EDD) building. For the reclamation works, the bund-type construction technique was used. Ito says JGC is currently executing over $33 billion worth of projects in the region, including developments valued at more than $10 billion in Saudi Arabia, $1-3 billion in Bahrain, $5-7 billion in the UAE, $5-7 billion in Kuwait, $1-3 billion in Oman, and around $10 billion in Qatar. 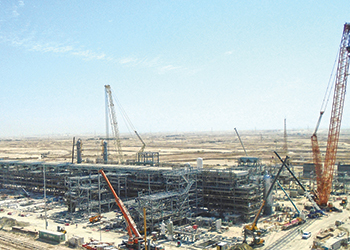 JGC Gulf’s other projects in Bahrain include engineering, procurement and construction management on a lumpsum turnkey basis of Gulf Petrochemical Industries Company’s (GPIC) urea formaldehyde (UF-85) project and the EPC of Bapco refinery’s enhanced fire protection system (EFPS). The GPIC project is expected to be completed next year, while the Bapco project will be ready in 2019.